New Year Wishes From The New Mr. + Mrs.
What better way to start the New Year than to celebrate as a newly married couple with all of your closest family and friends? Leah and Pete are to be married on New Year’s Eve at St. Clements Church, followed by a celebration at Le Méridien Philadelphia. Celeste Guiliano, who specializes in vintage pin up and theatrical styled portraits, took this amazing photograph of Leah and Pete as part of their engagement session. They sent this fun and festive Save the Date to get their guests excited for their big day! We can’t wait to help Leah and Pete transform their vision into their perfect day and start the New Year as a newly married couple! 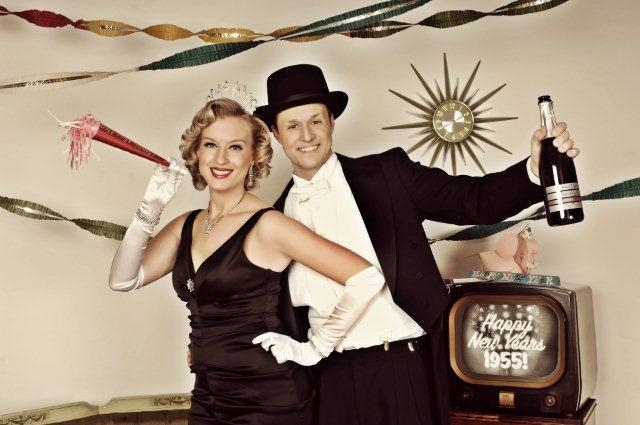 When the clock strikes midnight, we hope that you are ringing in 2012 with the ones you love! This entry was posted in engagements, real weddings, two little birds and tagged New Year's Wedding. Bookmark the permalink.